Words from Bishop Javier Echevarría on the fifth anniversary of the canonization of St. Josemaría. 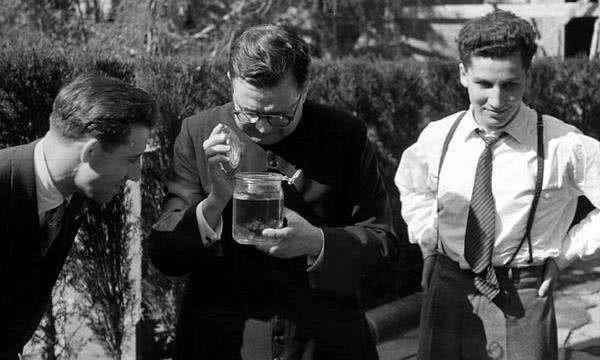 A young Javier Echevarria looking on, to the right of Saint Josemaria. 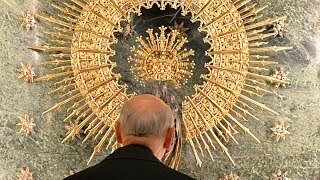 Five years ago, on October 6, 2002, before a large crowd of people from every race and corner of the world, John Paul II proclaimed Josemaría Escrivá, the founder of Opus Dei, a saint. On the following day, in the audience held in St. Peter’s Square for those attending the canonization, he described St. Josemaría as the saint of the ordinary. With this expression he summed up the core of the message preached by this faithful priest. Our daily activities—one’s family life, professional work, social relationships—are a path leading to heaven, if one walks with one’s eyes fixed on God and with a desire to help one’s neighbor. I had the good fortune (I see it as God’s gift) of being a direct witness, for a quarter of a century, to St. Josemaría’s concern to help many people overcome the split between their life of faith and their daily life. Right from the beginning of Opus Dei, on October 2, 1928, he taught that all noble human realities, since they have been willed by God and assumed by Jesus Christ in the Incarnation, can be a path towards holiness. “There is something holy, something divine, hidden in the most ordinary situations, and it is up to each one of you to discover it” (Homily Passionately loving the world, October 8, 1967). He spread this message—both with theological reasons and with practical advice—to men and women of the most varied professional and social walks of life, in personal conversations or in large gatherings, as in the homily I just cited, preached before more than twenty thousand people on the campus of the University of Navarra. Fusing one’s life of faith and daily life is a question of love. When love for God is the reason for a Christian’s actions, one finds it natural to begin, carry out, and finish these activities with one’s thoughts focused on God. The factory, the office, the library, the laboratory, the workshop, the confines of one’s home, are then transformed into the setting for a dialogue between the Creator and his creature, between a Father who loves his child madly and a son or daughter who has come to know God’s love. Everything becomes a possible topic for prayer. Similarly, when one fosters a true love for one’s neighbor, one feels the need to imbue one’s family, social, and professional relationships with the balm of charity. This is a very timely and important message in our day and age, afflicted by empty ideologies and actions that are driven by self-interest or a hunger for power. Christian charity is never something instrumental that seeks other goals. True love is gratuitous. Living charity in one’s ordinary life, says St. Josemaría, demands “a big heart, to share the concerns of those around us. We must be able to forgive and understand; we must sacrifice ourselves, with Jesus Christ, for all souls” (Christ Is Passing By, no. 158). As Benedict XVI recalled in his first encyclical, charity is the fundamental option of a Christian’s life. On the fifth anniversary of St. Josemaría Escrivá’s canonization, my heart and mind go to the many faithful and cooperators of the Prelature of Opus Dei who, together with their friends and colleagues, are giving their lives in social projects with deep Christian roots, in countries all over the world. They are thus following in the footsteps of the magnanimity St. Josemaría showed in fostering so many works of evangelization and human development in favor of those who are poorest, as John Paul II recalled in his address on the day following the canonization. Some of these activities have arisen precisely to celebrate that event in the Church’s life, in a way that would have pleased St. Josemaría. This is the case of the Laguna center for palliative care in Madrid, and the Harambee program for educational development in countries of Sub-Saharan Africa. Five years later, these projects are yielding greater fruits each day, both for those running them and for those they are meant to benefit. But the call to exercise Christian charity is equally urgent for people who do not dedicate themselves mainly or exclusively to social work. In one’s daily life, charity is inseparable from human affection: “We do not have one heart to love God with and another with which to love men. This poor heart of ours, made of flesh, loves with an affection which is human and which, if it is united to Christ’s love, is also supernatural. This, and no other, is the charity we have to cultivate in our souls” (Friends of God, no. 229). In these times that unfortunately are so marked by conflicts—at the family, national, and international level—putting charity into practice in daily life means, to a great extent, offering and accepting forgiveness. Forgiveness offers the only possible way to convert a field of battle into a place of cooperation and solidarity. To strive to understand others, to give and receive forgiveness, certainly demands great effort. It is a path that requires “beginning and beginning again,” but one that always nourishes hope. On the contrary, when a culture is lacking in forgiveness, it becomes difficult to maintain a united family, to work for common goals in civil life, to spread peace and joy in international relations. Besides, for a Christian, charity is the best language for transmitting the faith. As Benedicts XVI teaches: “a pure and generous love is the best witness to the God in whom we believe” (Deus Caritas Est, no. 31). Evangelization is never a question of communicating merely intellectual content. The discovery of the riches of our faith is often preceded by a personal encounter. Many people freely draw close to Christ when they experience the affection of Christians. In this sense, loving others in our daily life, with specific deeds, reveals to us a way of knowing and of making ourselves known. As St. Josemaría used to say, evangelization is a task that belongs to those with a big heart and open arms. The Second Vatican Council warned that one of the gravest errors of the modern world is the divorce between faith and daily life (cf. Gaudium et Spes, 43). Five years after the canonization of St. Josemaría, the saint of the ordinary, I beseech God, through his intercession, to help especially us Christians to unite in our souls love for God with affection for our brothers and sisters, for all men and women. I ask him to further our efforts to illumine each of our days with the splendor of charity.